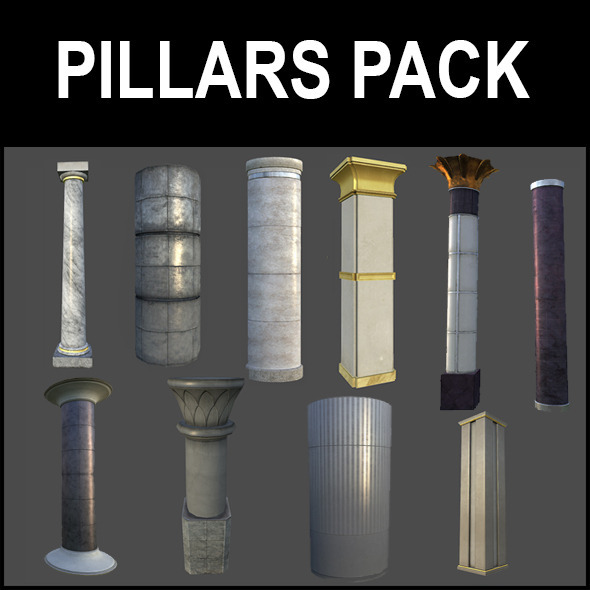 This pack contains 9 pillars for your games/media productions. These are low polygonal models. Average polycount is at 500 polys. - Maps included, 3 maps per model ( all in 2048×2048 ). Animated: No; Low-poly: Yes; Materials: Yes; Rigged: No; Textured: Yes; UV Layout: Yes; 3D File Formats Included: .3ds (multi format), .dxf (multi format), .fbx (multi format), .max (3ds Max), .obj (multi format); Created In: 3ds max 2012; Geometry: Polygons; Poly Count: around 500 per model. Keywords: 3d model, 3dsmax, column, dxf, fbx, marble, obj, pillar.